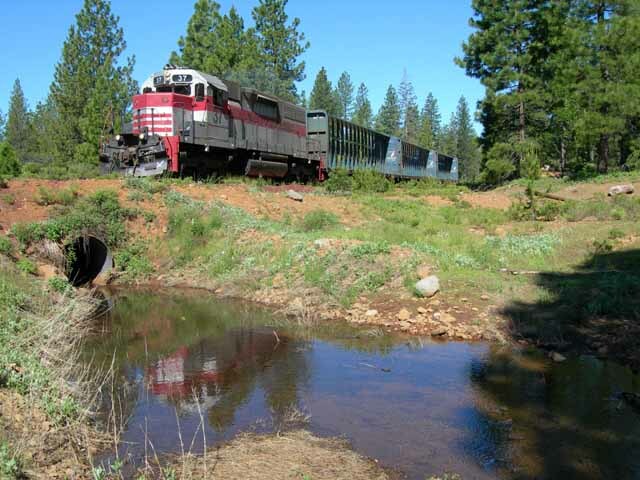 McCloud River Railroad - The Last Two Weeks? 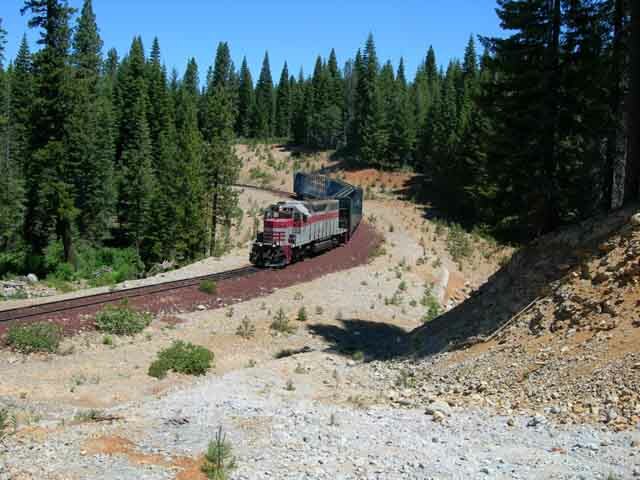 McCloud River Railroad : The Last Two Weeks? 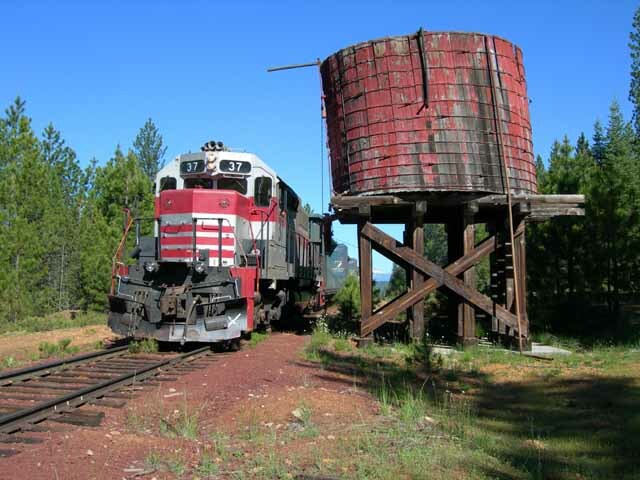 In mid-October 2005 the Surface Transportation Board granted the McCloud Railway Company permission to abandon the entire railroad east of McCloud, CA. The agency stayed the abandonment decision a few days later after Seaside Holdings Inc. filed a Notice of Intent to File and Offer of Financial Assistance along with copies of valuation reports and the like. 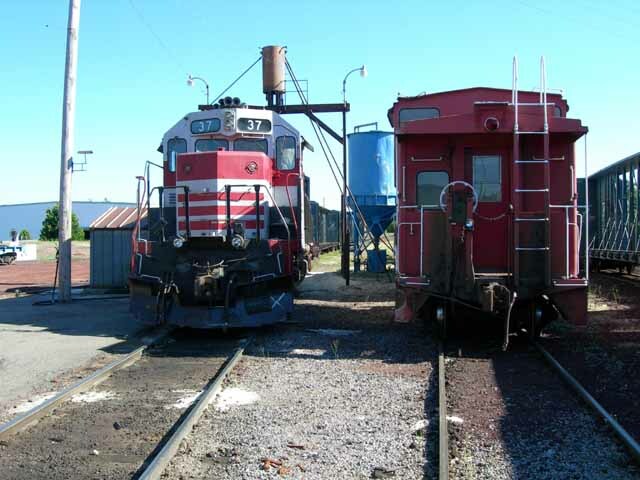 The McCloud Railway indicated it would need some time to pull the requested reports together, and the company finally delivered to documents to Seaside and two other parties that had filed Notices of Intent to File OFA's in early June 2006. 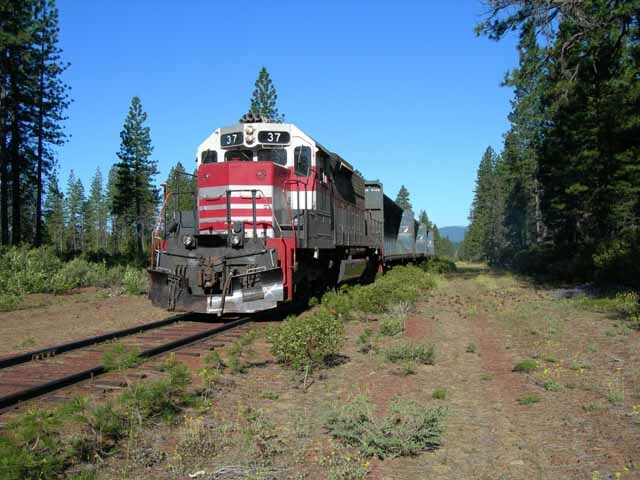 The McCloud valuation reports concluded that the part of the railroad to be abandoned has a net liquidation value of $4.8 million dollars. Meanwhile, the freight operations struggled on through the winter, which proved to be another trying one. The winter produced nowhere near the record snowfall amounts seen in some previous years, but the skeleton workforce left on the payroll and the once or twice a week freights made opening the line and then keeping it open a challenge. Years of deferred maintenance also took their toll, as derailments became almost a weekly event. Most of the wrecks were minor ones, but one on 2 June 2006 near Curtis tipped one loaded centerbeam on its side and shook up a couple other loads. Contracted cranes cleaned the wreck up and the employees patched the tracks back together so that the line could continue operations. The Staggers Act of 1980 allowed railroads among other things to levy surcharges on traffic moving over unprofitable routes to help the railroad cover the full costs of providing the service. Surcharges can aslo be used to discourage further use of a railroad that is losing money and has not real hope of becoming profitable in the future. 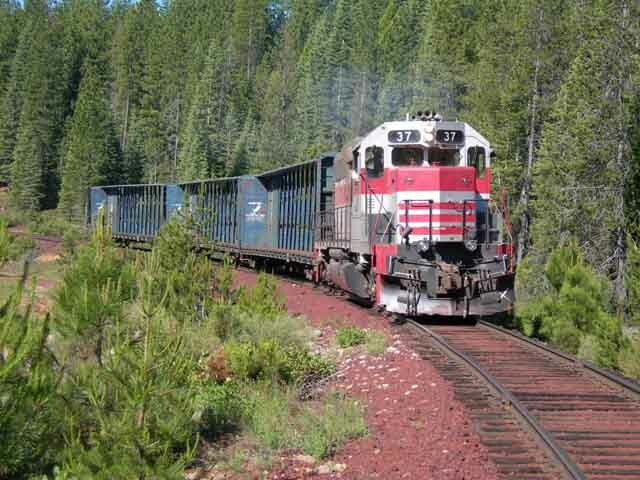 On 12 June 2006 the McCloud Railway implemented a $350 per carload surcharge on all freight traffic moving to and from Burney and then let the shippers know that the surcharge would be increasing to $1,000 per car on 1 July. The two remaining shippers, Dicalite and Sierra Pacific Industries, had already been making plans for alternates to the McCloud Railway, and as the $350 surcharge went into effect they implemented them. Dicalite established a new reload on the BNSF at Nubieber, CA, and Sierra Pacific increased shipments to its reload on the BNSF, also at Nubieber, and started trucking some loads to their sawmill in Anderson, CA, to be loaded directly onto the UP at that point. However, Sierra Pacific still had a few loads to ship, which carried railroad operations through the last two weeks of June. This photo essay depicts operations during those last two weeks. Due to the number of photos and text this essay is spread over several pages. The first day of the second week of June started with a Yard & Hill Job. 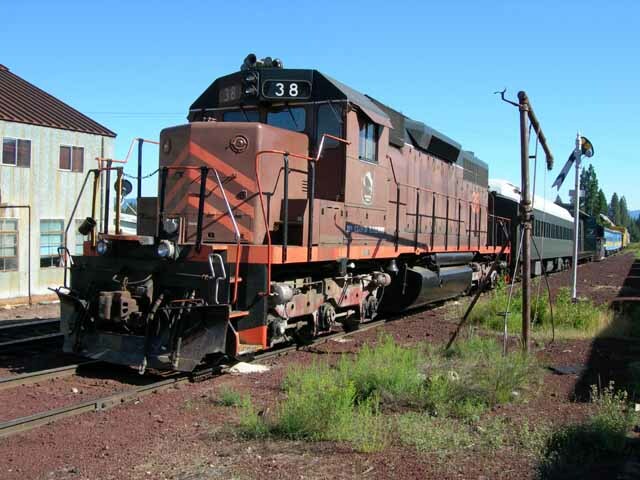 The railroad had brought in roughly a half dozen lumber loads from Burney late the week before, and on that day the #37 took them over the hill and returned to McCloud with three empty centerbeams. The railroad wrapped up the day's work by 1 p.m., well before McCloud Rails staff arrived in McCloud. The late afternoon sun is starting to cast long shadows as the #37 waits quietly for the following day underneath the sanding tower. Locomotive #38 waits on the next track over. Day 2 dawned bright and early. The one man train crew, Bob Sharrah, reported to work at the shop building at 7:00 A.M. After firing up the #37 and letting it warm up for a few minutes the short train departed eastbound. Today's orders called for the train to operate from McCloud through to Cayton, with a side trip to Car A on the Lookout Line to get the last of the boxcars stored there. The train would be left at Cayton overnight, with the rest of the run to the Sierra Pacific Industries sawmill and return to happen on Wednesday. The trip to Car A is covered on the Last Train to Car A page on this website. 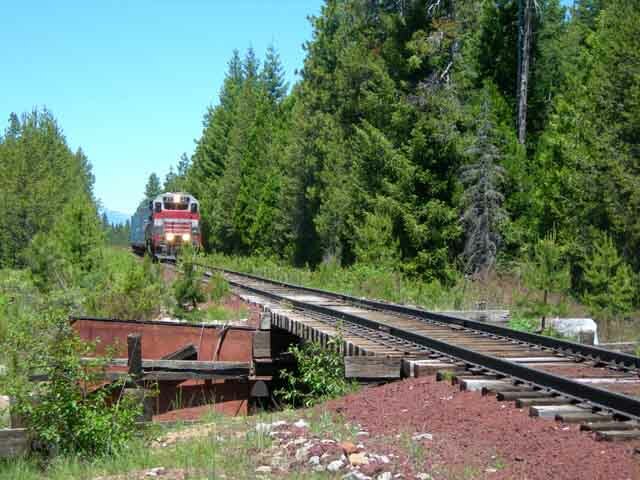 A few miles east of McCloud the railroad runs on a long tangent. The train is seen here at the end of that tangent. The #37 is preparing to cross Ash Creek. Tremendous mud flows off of Mount Shasta buried the railroad at this point on several different occassions in the late 1910's/early 1920's. 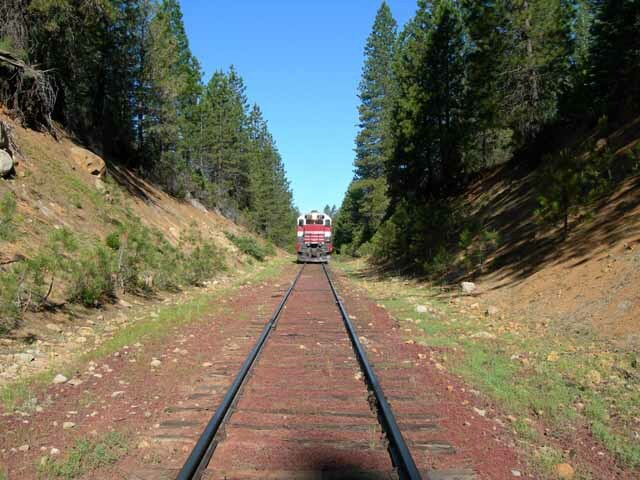 In 1959 the McCloud River Railroad completed a line change a dozen miles east of McCloud that resulted in a shorter and straighter route than the original line. This large cut lies at the eastern end of the shortuct, just west of the site of Kinyon. A few miles east of Bartle the railroad rouns Nebraska Curve. This spot used to provide a panoramic view of trains passing by, but tree growth severely limits visibility now. The train passing the old water tank at Bartle. The tank will not remain standing for too many more years. Less than a mile east of the Bartle tank the train arrives as the Bartle Wye, where the branch south to Burney leaves the original mainline to Car A. The #37 leaves the three centerbeams here and then heads up the Lookout Line to Car A to get the last four boxcars stored there. The culvert at wye created this little pond in the stream, allowing for this mirror image of the #37. Another view of the #37 at the Burney branch switch. The #37 left the boxcars brought down from Car A at Bartle before continuing on towards Burney with the empty centerbeams. 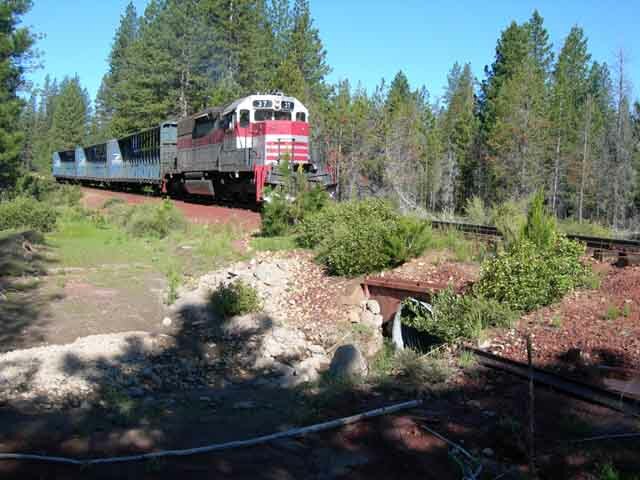 The train is seen here rounding the fill at the McCloud River crossing. This fill has been wiped out twice by flood waters in recent years, first in 1986 and then again in 1996. A few miles futher on the train is about to cross over Moosehead Creek on a short bridge. The original plans called for the #37 to take the centerbeams as far as Cayton, where the train would be left for the night. 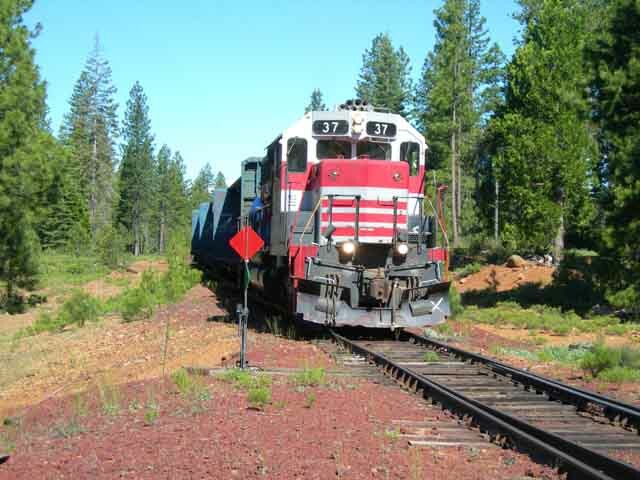 However, those plans changed in the afternoon when the train found a section of wide gauge near Milepost B-38. Two wheels of the rear truck of the #37 and three wheels on the lead truck of the first centerbeam fell through the hole and onto the ties. This was the third derailment to happen on this curve since the beginning of the year. 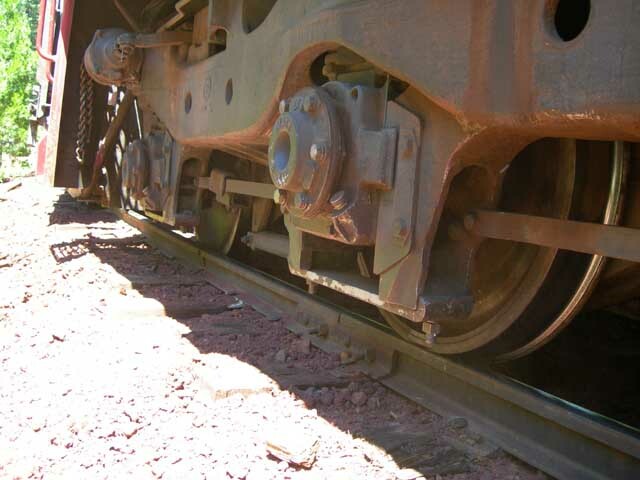 This picture shows one of the wheels of the locomotive sitting inside the rail.